An optimized Google My Business (GMB) profile is critical if you want people to find your local business online. 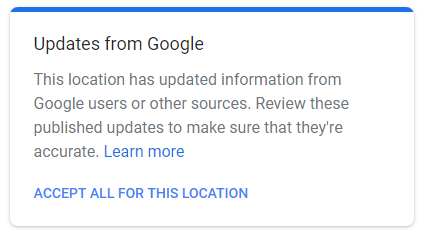 A verified and complete profile lets Google know that you’re a legitimate business and makes it much more likely that they’ll list your business in relevant local searches. When they first started, local Google listings for businesses were little more than your name, address, and phone number. Since then, GMB has expanded into a robust tool to build your local business’s online presence. 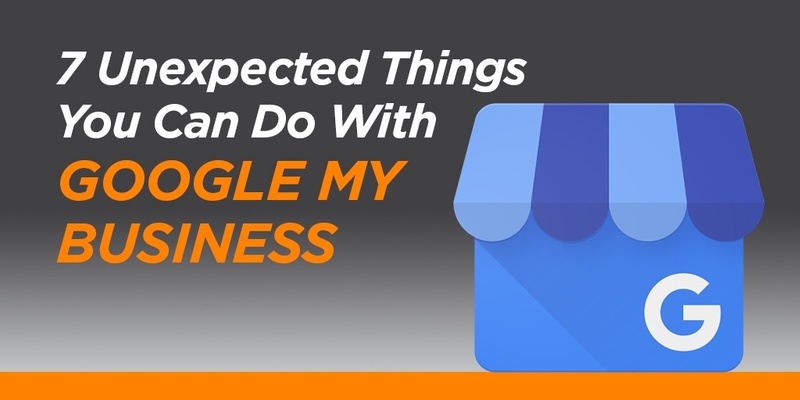 Here are a few unexpected things you can do with Google My Business that you might not know about. 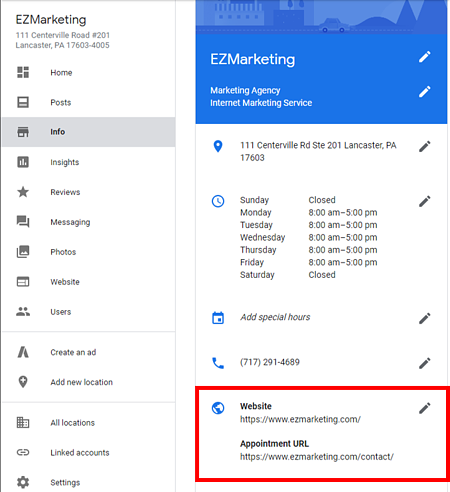 Google My Business Posts are a new feature that allows you to publish events, offers, and news directly to your business listing on Google Search and Google Maps. Posts will show up in the Knowledge Panel when someone searches for your business, as shown below. They look similar to social media posts and can include photos, videos, and a call to action button that links back to your website. When a user clicks on a post, it expands into a larger, attention-grabbing box with a news feed of your latest posts. Each Google Post will display in Search and Map results for up to 7 days. 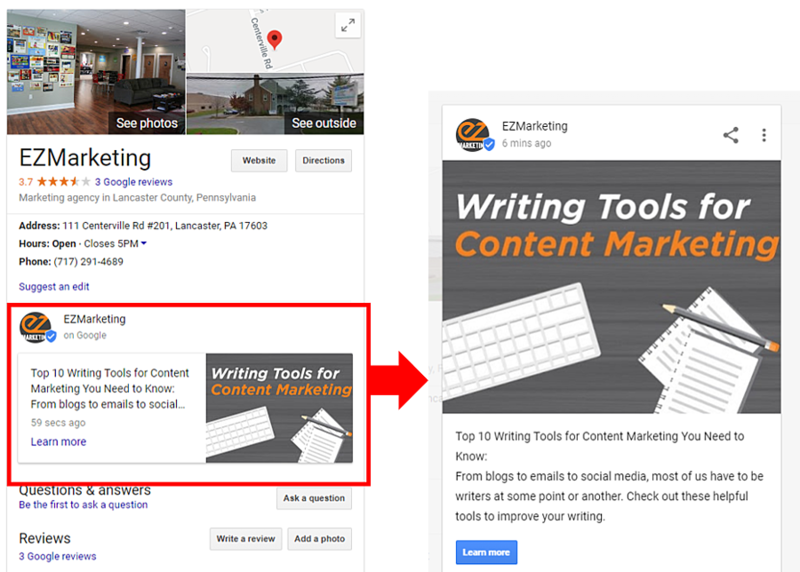 Google Posts are a great way to help your business stand out. You can use them to promote current sales and specials, announce new products/services, draw more people to events, or just share valuable content (like blog posts). Not only does this help you gain more exposure, it can help boost your SEO by promoting your content and drawing more organic traffic to your website. Finally, Posts improve your customer experience by providing relevant, timely information to anyone searching for your business. 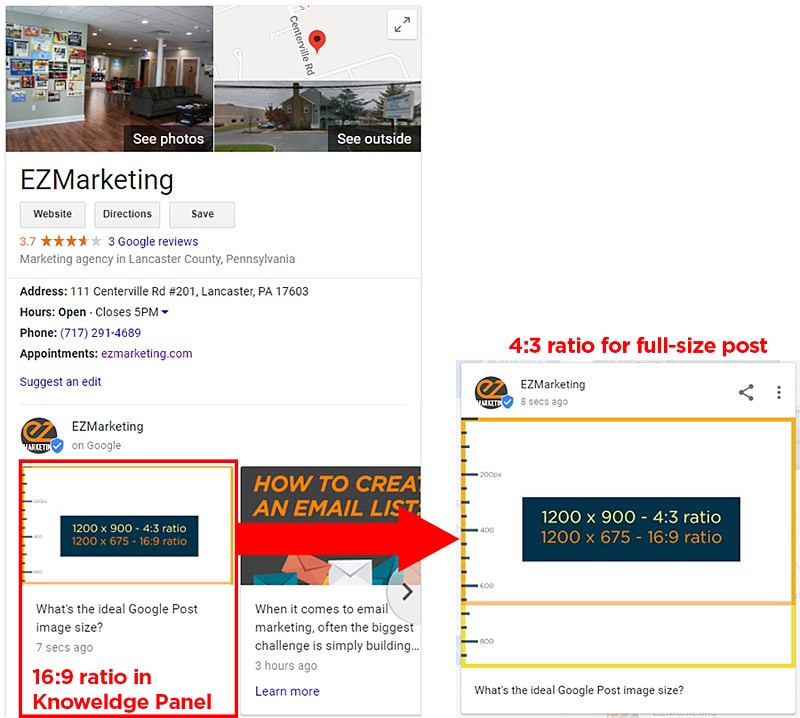 What’s the best Google Post image size? The minimum image size for a Google post is 400x300 pixels. To make sure the image displays well on higher-resolution screens, we recommend a larger 1200x900 image, which maintains same 4:3 ratio. Within the Knowledge Panel, the image displays at a 16:9 ratio. The tricky part is: Google automatically crops this image, and it seems to change based on the content of the image. In the first example below, Google only cropped off the bottom of the image. But when we added a full-color image and moved the text, they cropped off some of the top as well. 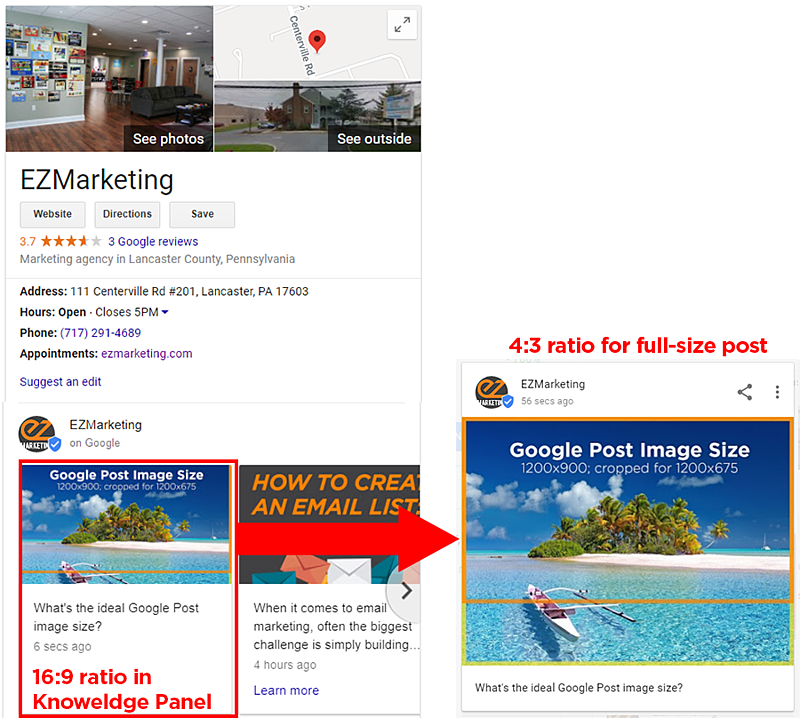 Our best recommendation is to make your Google post images 1200x900 pixels (4:3 ratio), but make sure they look good when cropped to 1200x675 (16:9 ratio). Also, try to keep text or key elements away from the top and bottom edges of the image to keep it from getting cut off. Google is making it easier than ever for your customers to do business with you by allowing you to book appointments directly from your listing. There are two ways to do this, depending on your business type. For some business categories like hotels and restaurants, Google actually connects directly with your third-party booking services. If eligible, you’ll see a Bookings tab on your Google My Business dashboard. Select from one of Google’s supported scheduling providers, and you can add an eye-catching Book Now button to your listing. If you don’t have the Bookings tab, you can still use an Appointment URL (found on the Info tab) to help customers take action directly. This is a great option if you use any type of online service to help you schedule appointments. At the very least, you can link to your normal contact page to make it just a little easier for interested prospects to contact your business. Live chat is exploding in popularity as a way for businesses to engage with prospects and offer customer service. By adding a texting-enabled phone number to your listing, you can allow people to message your business directly. Simply make sure that the phone number can receive SMS messages, and have someone ready to answer messages promptly during business hours. Customers will see your average response time, so speedy replies are a must. To help out, you can add an automatic welcome message that works 24/7. While messaging on GMB may not make sense for everyone, it could be a great option if you have limited customer service staff to answer live phone calls. This one might not seem unexpected, but it’s actually a recent change for Google My Business listings. Earlier versions allowed you to write your own description, but Google soon disabled the function, likely due to businesses posting spammy or keyword-stuffed descriptions. Google does still review these descriptions, so make sure you’re posting relevant information and following their guidelines, or Google may remove your information. Descriptions are limited to 750 characters, and only the first 250 show in the Knowledge panel, so try to front-load your most important information. You also can’t include any links in the description. Note that Google may automatically write short descriptions and snippets about your business that you can’t edit. Business descriptions are also unavailable for the hotel category – Google automatically populates your Hotel Details. Unfortunately, Google will not change any of these descriptions unless they reflect incorrect or misleading information. One of the best ways to make your Google My Business listing stand out is to include visuals. Businesses with photos actually receive 42% more requests for directions and 35% more click-throughs to their websites than businesses without photos. Now, Google is giving you even more options to include engaging visual content by supporting video. 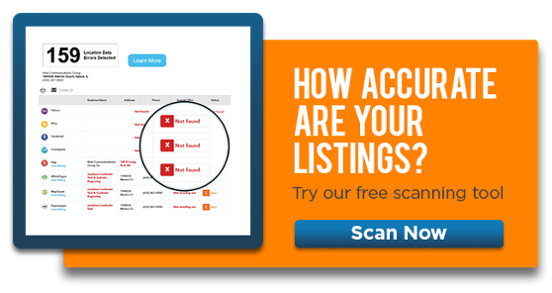 You can upload videos up to 30 seconds long to your listing. Just make sure they are 720p quality or higher and less than 100 MB in size. Videos are a great way to show, not tell people about your business and your work. Post videos that tell prospects what your business is all about, and explain your products, or show off your successful work. Sometimes the most unexpected things about your Google My Business listing are the changes you don’t make. Other users make them for you. Google believes in the power and validity of crowd-sourced information, so they allow users to do things like upload pictures, answer questions, update incorrect information and, of course, review your business. Most of the time, this a good thing, since user-generated content adds richness and validity to your profile. It even allows your loyal customers to help promote and advocate for your business. However, it does mean that spammers and yes, even your competitors could edit your listing. Often, these changes go live without any review or approval from you. In theory, you should receive a notification whenever someone suggests a change, but as this article from Moz points out, that’s not always the case. The best thing you can do is regularly monitor your listing and look for any Google Updates on your GMB dashboard. Finally, speaking of regular monitoring, Google wants to make it as easy as possible for business owners to review their listings and keep them up-to-date. 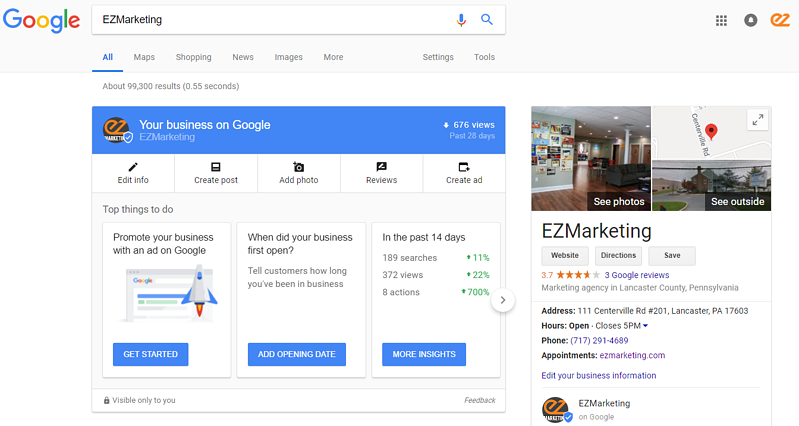 They’re testing a feature that will show you a Google My Business dashboard, right within your search results. As long as you’re logged in to a Google account that has admin access to your GMB listing, simply do a Google search for your business name. At the top of the search results page, you’ll see an abbreviated dashboard that lets you easily make edits and updates, as well as see your latest analytics and insights. This dashboard is only visible to you; your customers will just see the Knowledge Panel on the side, as usual. If you are having trouble or simply do not have the time to put into creating and maintaining your GMB account, then check out our Google My Business listing services we offer. We are more than happy to handle your GMB needs for you. If you want to learn more about Local SEO, check out these related articles, or try our quick scanning tool to find out how your local listings stand up.